Every year, some new game claims to have revolutionized the art of shooting people in the face. Most of the time, it doesn’t feel true. With Splatoon, it does. Splatoon is fresh. Splatoon is exciting. Splatoon makes me forget that I ever had shooter fatigue in the first place, something that I haven’t felt since the days of Super Monday Night Combat, back in 2012. Splatoon is a competitive multiplayer third-person shooter from Nintendo EAD. It’s out on May 29th for the Nintendo Wii U. The gist is simple: Two teams of four players compete for map control. There’s a twist, of course: Your guns fire ink instead of bullets, and while you can shoot players on the other team, it’s just as important to paint the walls and floors of the level with colorful splashes of paint. It’s as much about making a big inky mess as it is about shooting the other team—think of it as a shooter for the Nickelodeon generation. Do not be be fooled. These are not normal teens. See the suction cups on the girl to the left? Yeah. She’s a squid girl, the mutant product of what I assume to be an alternate timeline where Mario did not manage to clean up Isle Delfino in Super Mario Sunshine. But I digress. The result is a giant, bright mess...upon which you can totally surf. That sense of movement is where Splatoon shines. While you can trot around using your legs if you want to, you’re probably going to use the squid form more than anything else. Playing Splatoon feels like going on a giant, perpetual Slip ’N Slide. Splatoon offers two primary modes: single-player and multiplayer. The single-player game is a series of challenges that task you with saving creatures called zapfish on Super Mario Galaxy-like stages. On its own, I didn’t find the single player very interesting—you basically go from one platform to another, collecting orbs and mowing down enemies with your inkblaster. But the single player is a good way to familiarize yourself with Splatoon’s squid mechanic, as it presents you with a number of obstacle courses that require platforming and efficient use of ink to get around. 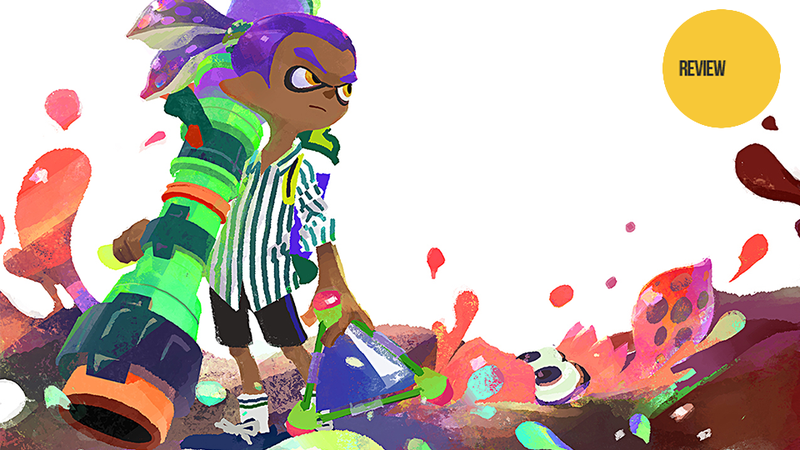 You can also learn a few things about Splatoon’s lore—because yes, the game does have a story! That, and the single-player is a good way to earn gear that you can’t get anywhere else. You’ll probably spend most of your time in “Turf Wars,” a mode where you have to cover as much of the map as possible with your team’s ink color. At the end of the round, the game calculates what percentage of the map you actually claimed—the team with the most surfaces covered wins. It’s a mechanic that adds a delightful element of tension to the end of matches, particularly close matches, as you always have to wait for the game to crunch the numbers on your paint coverage. Matches in Splatoon start with frantic bursts of fire as players try their best to cover ground immediately. The shooting is continuous to from start to finish, which probably explains why rounds are only three minutes long: any longer might be overwhelming. Three minutes is all that Splatoon needs to show off its design. The basic mechanics are simple, but in practice they prove very flexible. Consider inking, for example. Do you want to lay claim to more territory with your ink? Do you want to use the ink to provide yourself with pathways to move about more efficiently,? Do you want to pressure the other team by hunting down their players? (Inklings are hurt by the paint of the opposing team!) 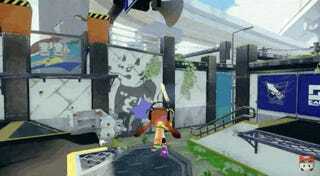 Do you want to use your ink to recover territory the other team has already claimed? Do you give in to the compulsion to cover smaller blank spaces your team has overlooked, or do you forge forward, looking for fresh ground to paint? Each of these approaches requires you to use your ink in different ways, and you constantly have to make decisions about which one is more important in any given moment. Notice how a lot of these decisions don’t involve killing enemy players? Unlike other shooters, killing other players as soon as you can is not always the best move in Splatoon. Having a high kill/death ratio does diddly squat for your overall standing, and it might be more useful for you to focus on inking wide swaths of ground than on getting rid of a given opponent. At the same time, managing the enemy’s roster is still important. Whenever the other team is down a player, your team is granted a temporary advantage. I like to think of it as giving my team a power play: whenever I kill an enemy, we have X number of seconds to make a concentrated push and gain more ground. 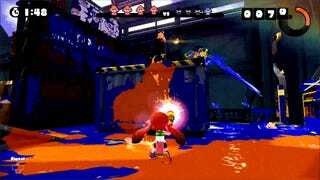 In this way, Splatoon enjoys the type of tactical depth of an objective-heavy game like Battlefield, but it can still give you the high that comes with dominating the enemy in a kill-focused game like Call of Duty. There’s also a stealth of element to the game: when someone stays perfectly still in squid form, you can’t see them. Some of my most memorable moments involve hiding in an innocuous splotch of paint, only to then ambush an unsuspecting team. Swimming, in combination with a mechanic that lets you tap on other players to rocket to their location, make Splatoon feel very kinetic and fast-paced. It doesn’t take very long to get to any particular part of the map, or to come into contact with the enemy team. But again, confrontation is not always the answer—you always have to consider whether or not you can actually hold a position, and that’s where a lot of Splatoon’s most interesting tactical decisions come in. The weaponry in Splatoon is great, too. There are things that have obvious analogues: you’ve got water guns that act like assault rifles, submachine guns, and even sniper rifles. But Splatoon also has a variety of creative weapons, like paint rollers, water balloons, and sprinklers—all of which are fun to use. Primary weapons also come with an associated power-up, which you can activate once your special meter fills up. The more ground you cover with paint, the more power-meter you gain. Personally, I roll with something that gives me a temporary bazooka that can one-hit-kill anything in its path. But there are more interesting power-ups, like one that allows you to become a giant kraken, and a power-up that summons an ink tornado anywhere on the map. After spending nearly 30 hours with the game, I have not unlocked all of the weapons that the game has to offer yet—there are tons of them, each one with its own distinct twist on spraying ink everywhere. What I can’t say for certain is just how balanced all of this gear and equipment is. Nothing seems outright overpowered, but I’ve also been playing with a small pool of reviewers granted early access by Nintendo. It’s hard to pick out trends with so few people playing the game, though I have seen other people complain about getting stomped when fighting against higher level players. I seem to win just as often as I lose matches, so I can’t really tell. I will say this: if Splatoon is the Mario Kart/Super Smash Bros. of shooters, it’s likely not balanced at all. But hey, neither are most shooters. Maybe it doesn’t actually matter all that much. As much as I like Splatoon, it’s riddled with smaller issues that reveal Nintendo’s inexperience with modern multiplayer shooters. In many ways, that’s a boon: Splatoon obviously borrows from other popular shooters in ways that benefit the core design, but leaves behind many of the things that make the genre feel stagnant. But, as much as I harp on other popular shooters in this review, they also tend to nail smaller details that Splatoon often misses. In Splatoon, you can only use the tablet controller, not the Pro controller. The tablet controller is not exactly built for a shooter, making things like aiming and comfort difficult. Bafflingly, you can use the Pro controller only in a local multiplayer mode that lets you play against another player. Splatoon isn’t really the sort of game you want to play with just one other person. Matchmaking isn’t particularly sophisticated. It doesn’t work based on skill—it just searches for other players blindly (unless you play in ranked, that is). Once you go into a matchmaking search, you can’t back out of the lobby. You’re stuck in there for a couple of minutes, and the timer resets every time the game finds a new person the pair you with. You also can’t start a match without eight people exactly. If you do go into a match, you’re stuck with whatever load-out you went in with—you can’t change your gear or weapons mid-match. Splatoon lets you play with friends, but there’s no guarantee that they’ll be on your team—the game mixes and matches the people in your lobby every round. If you’ve played multiplayer shooters in the last few years, you’re probably shaking your head at a lot of that. I have managed to overlook all of these missteps because I like the core game so much. But I also recognize that the shortfalls in Splatoon may prove to be too much for other players. You wouldn’t know it just by looking at me, but my designer headphones let me consume less ink while using my sub weapons, lets me respawn quicker, and also increases how long I can use special weapons. My checkered shirt lets me save ink on my main weapon, increases my damage, and also buffs my defense. My golden shoes let me run faster, increase my defense, and let me jump faster. Who knew dressing like a hipster could make someone so powerful? More importantly, though, my gear is on fleek. Splatoon is the most stylish game I’ve played since The World Ends With You, and its flair enlivens things in welcome ways. I can’t remember the last Nintendo game that looked or sounded this cool. By this point, this kind of customization is old hat in shooters. Splatoon goes all the way with it, though, and it does so in the most natural way possible. Consider the cosmetic options in a standard military first-person shooter. Do I really want to pick the paint job on the gun I’m going to use to blow someone’s brains out? Do I really need to pick out what color of camo I’m going to wear to visit [insert middle eastern location here]? I don’t have to think about stuff like that in Splatoon. There are only two considerations: what will be useful? And more importantly: what clothes will make me look cute? Looking good is just as important as utility in the world of Splatoon, and the game constantly reminds you that your threads should be on-point. To this end, Splatoon offers you a selection of shops that change stock daily, giving you a good reason to return to the game regularly. Here, you can purchase a wide variety of shoes, shirts, and headgear using money you gain from the multiplayer. I regularly find myself completely broke because of how often I go on shopping sprees. The game then gives you the option to order these items through an underground network. Splatoon’s version of a drug dealer will search for these items on your behalf, for a price. It takes a full day for this character to find what you want, and whatever he brings back to you will not necessarily have the power-ups that the gear you originally asked for did. This can be annoying, but it does mean that specific pieces of gear are not tied to specific power-ups—and that’s a great thing! It’s entirely possible for you to find gear that you like with the specific bonuses that fit your playstyle. It just might take a while. What impresses me about Splatoon’s focus on fashion is that it pulls it off without evoking the more awful parts of that culture. I am not a person with an actual fashion sense in real life, and that’s resulted in a lot of shame and insecurities over the years. But in Splatoon, that baggage is not a handicap. Everything in the game is built to look and feel good. You can’t really go wrong with any combination of clothes. Sure, you can sometimes feel judgemental and inadequate, especially when you walk around checking out other people’s ensembles. But overall, the game feels empowering. I mean this literally. While you’ll wear a specific get-up for the single-player, your hand-picked gear carries over in multiplayer. Whenever anyone talks about Splatoon, they tend to talk less about strategies and shortcomings and more about the game’s fundamental longevity. For starters, it’s only available on Nintendo’s not-that-widely-owned Wii U, meaning that the potential player base is much smaller than, say, Call of Duty or Destiny. But even putting that aside, I can’t help but recall the fate of other new multiplayer shooters. Remember Titanfall? Evolve? Both games were hyped, and by most accounts, both games were very fun to play. But neither has what I’d call a thriving player-base. If cross-platform behemoths like those can’t thrive, does Splatoon have a chance? This is the thing that I find myself discussing with most players that are interested in Splatoon: its chance of survival. I hate to say it, but I have my doubts. There are glimmers of hope. For one thing, Nintendo has promised to update the game with new content in the coming months, adding in more maps and modes that can keep the game alive after launch. Judging from the way Nintendo has responded to popular fan complaints in games like Smash Bros. and Code Name: Steam, I wouldn’t be surprised if they’re open to tweaking Splatoon, too. Splatoon offers something very valuable: it challenges our notion of what shooters have to look like, and how shooters have to work in order to be fun. In this way, Splatoon isn’t in competition with the reigning titans of competitive video game shoot-outs. It’s on an entirely different playing field.